This fall, SPA launches a pioneering program that will harness the ambitions and driving curiosity of freshmen from across the nation. The Politics, Policy and Law Scholars Program is a three-year BA program that will allow students to experience Washington, D.C., as a laboratory for learning inside and outside of the classroom. In their coursework, PPL Scholars—freshmen who have applied and been admitted to this intensive program—will undertake a rigorous curriculum with a focus on analytical research and writing. The Scholars will also visit and intern at think tanks, government agencies, Capitol Hill, the courts, and non-profits to bring a real-world perspective to their academic work. And they will experience the program as a cohort; students will go through their studies as an intact learning group--living and learning together. 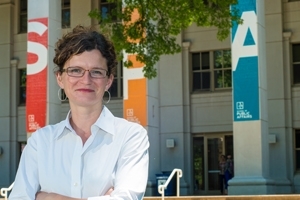 Professor Jessica Waters will lead the pioneering group and program. Waters, trained as a lawyer, brought AU’s Mock Trial team to new heights of success as a top, nationally-ranked team. She also earned her BA and law degree at AU and is a noted advocate for children’s rights in D.C. courts and non-profits. Waters’ knowledge of AU and her successful approach to learning and mentoring make her an exciting leader for PPL Scholars. What drew you to lead PPL? There is so much about the PPL Program that excites me. First and foremost, it’s an opportunity to work with talented and driven students. Second, the focused nature of the program will allow the students to establish critical relationships with faculty mentors, and I’m excited to be one of those mentors. The professors I worked with while an undergrad at AU continue to be my mentors to this day, so I really value those types of relationships. Finally, I’m also a huge proponent of using D.C. as a learning laboratory, and PPL will give students the chance to put what they are learning in the classroom to work in Washington. What kind of student do you think will most enjoy the PPL experience? The PPL Program will certainly be very rigorous, so we are looking for students who are self-motivated, driven, and ready to tackle the public policy issues of our time. Our first class of Scholars certainly appears to fit that model! The PPL program has flexibility in the curriculum. What options can a student expect? PPL Scholars can choose to major in two of our most interdisciplinary majors: Communications, Legal Institutions, Economics, and Government (CLEG) or Law and Society (LS). The nature of these majors means that students will tackle issues from a variety of perspectives and lenses from different academic disciplines. We’ve also built in enough room so that the Scholars can choose to add a minor to their course of study, or to take elective courses in a subject unrelated to their majors. When designing the program we were very careful to make sure that the Scholars will be able to pursue their many academic interests. What is the Living Learning Community, and why is it an important part of the PPL program? Students will also have the unique opportunity to live with their fellow PPL Scholars during the first year, where they will further enrich their academic experience. This community will allow them to continue learning even back in the dorms, hopefully discussing their academic work and D.C. experiences, but also (and just as importantly) to just have some “down time” with their colleagues. And, of course, it’s not all work and no play—we’ll be taking trips to local restaurants, Nationals games, and cultural events. What do PPL scholars do over the summer? During their first summer, the Scholars will intern in D.C. and take classes. During their second summer, they will have the opportunity to study abroad. What do you hope your PPL Scholars will get out of this experience? I hope that these students will take full advantage of all that AU and D.C. have to offer. Speaking as a former student, I now realize how lucky I was to have incredible internship and work opportunities in D.C., and to find the faculty mentors that I did. I want to give the Scholars that same experience.